Forgot to mention my visit to Sita Ben, the bead lady. 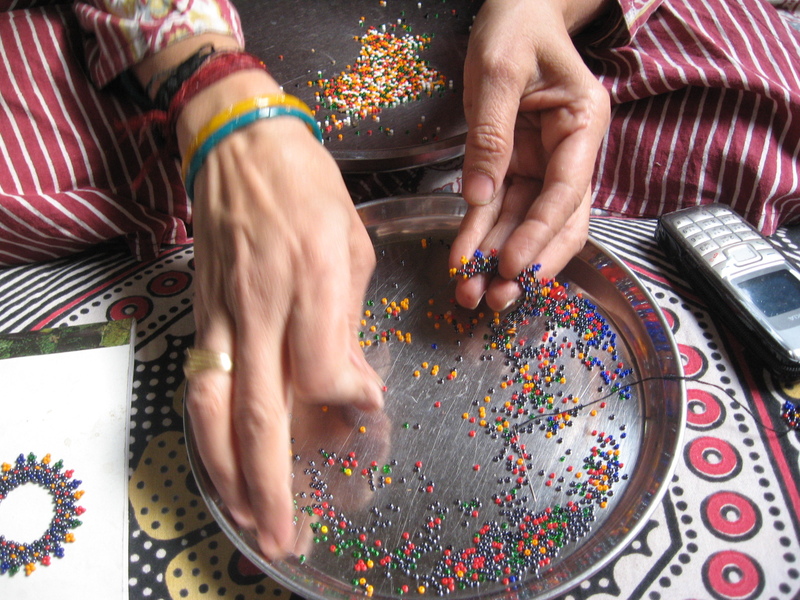 Spent a very happy morning at Sita’s home, sitting cross-legged on the floor looking at her amazing bead work and then learning to do some basic threading. 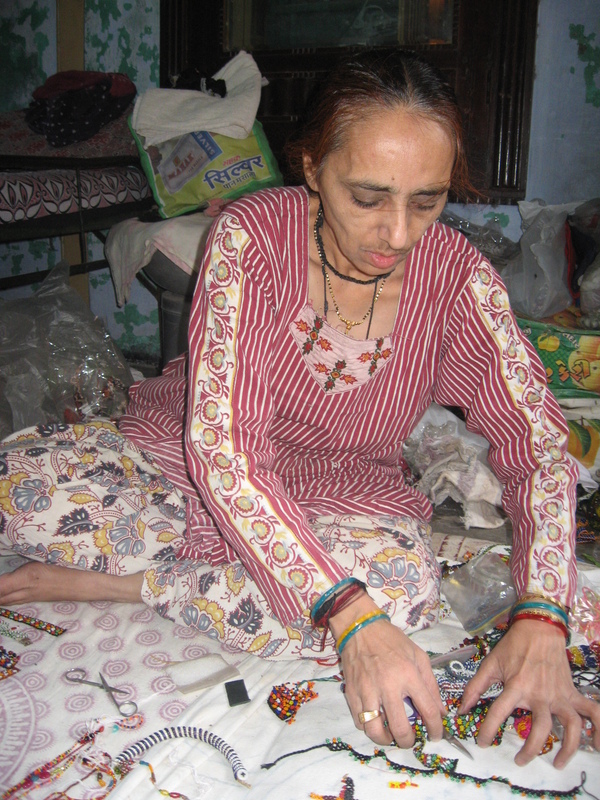 It was incredible to see how quickly she worked, picking up the tiny beads with the finest needle I have seen (just threading it was epic for me!). Sita was an a very patient teacher, especially as we didn’t have much common language to draw on. We did a lot of mime and laughed a lot. 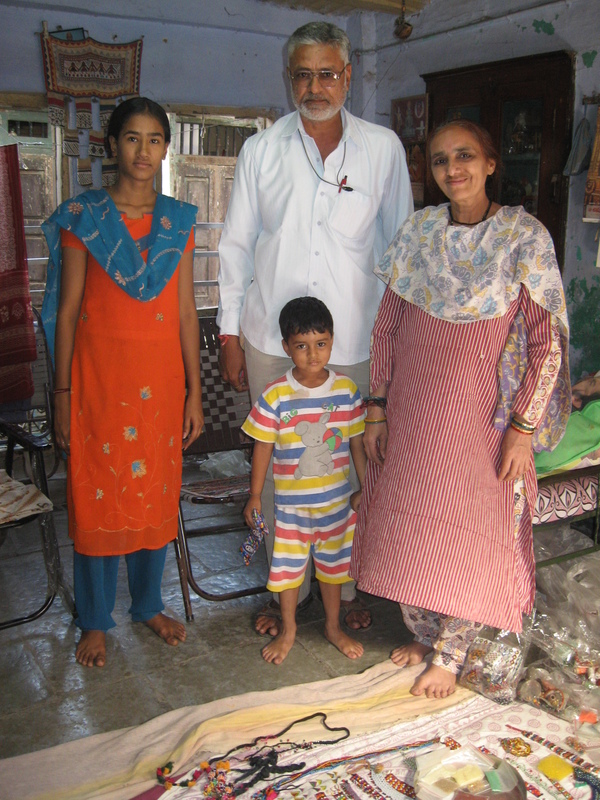 Her grand-daughter was there too, learning as well, and her brother arrived as well, with a vast breakfast for us. Everywhere I go here, people are so generous and proud to invite guests into their homes. 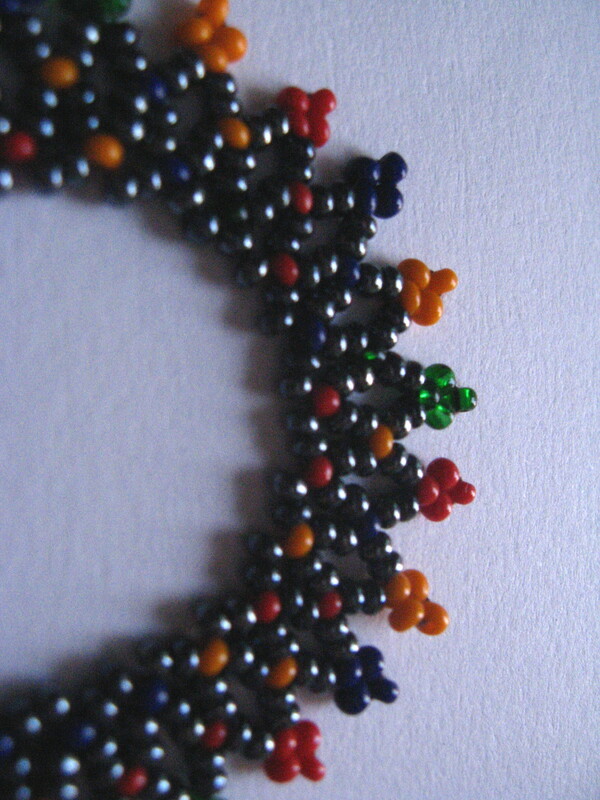 In about 15 minutes Sita showed me how to make a simple bead loop. It took me 2 hours to copy her but I was very pleased with the result. She gave me a beading tray, needles, thread and some bead to try some of my own. Lovely! Oh and she also gave me a lovely bead necklace which I am wearing now. Her brother gave me a lift home on his tiny scooter afterwards. Hair-raising! But such an inspiring morning. Am not sure how I will end up using beads in my own work, but I see them everywhere here, not just on clothing, there is something worth pursuing. Would be fun to try to make some paper/text beads. I went to a bead store in the old town and bought lots of interesting shaped and coloured beads to play with when I get home. 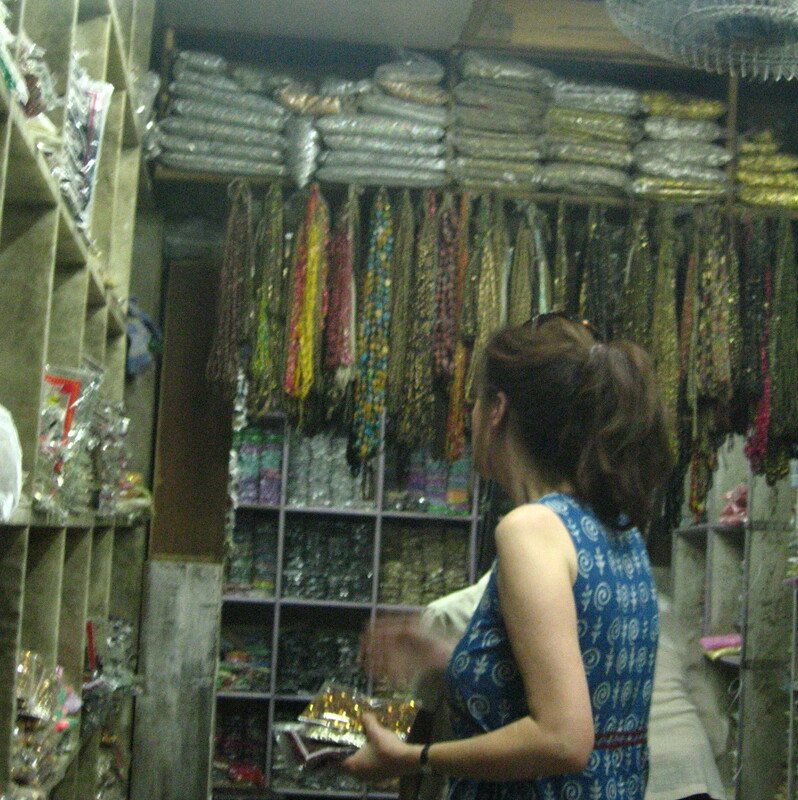 The shop itself was amazing; three floors of tightly packed floor to ceiling bottles and bags of exquisite coloured beads. It was a privilege to be allowed in; normally customers (only trade) have to stand at the counter while the workers fetch what they want, but after going back and dithering a few times, the manager gave in and let me go in and fossick. 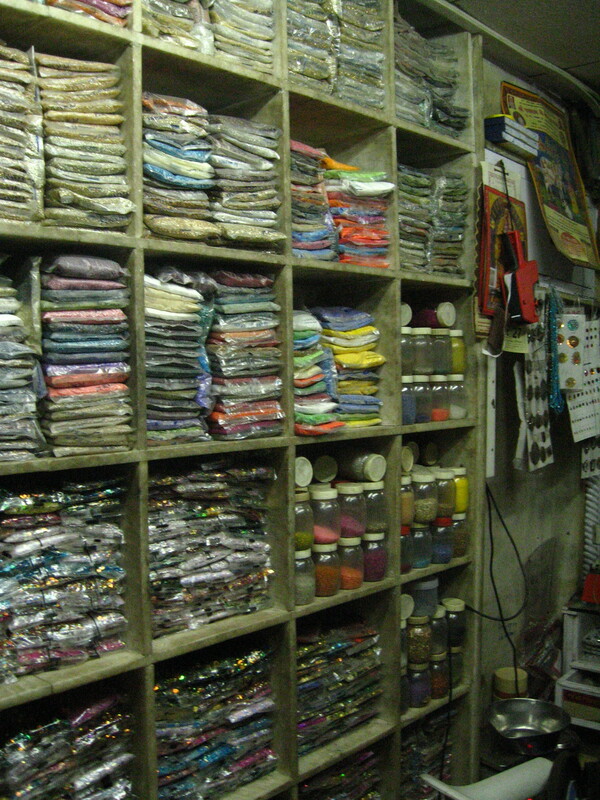 Talk about Aladdin’s cave!